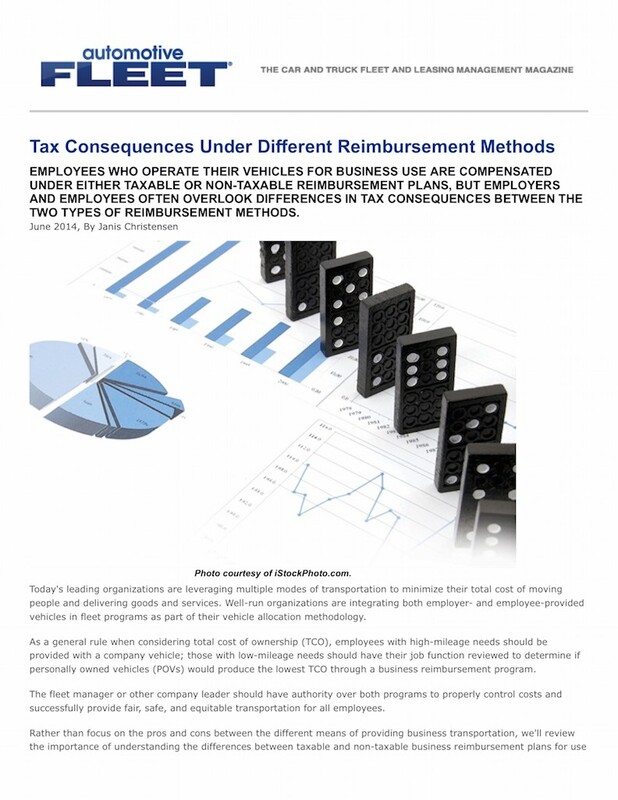 Employees who operate their vehicles for business use are compensated under either taxable or non-taxable reimbursement plans, but employers and employees often overlook differences in tax consequences between the two types of reimbursement methods. Today’s leading organizations are leveraging multiple modes of transportation to minimize their total cost of moving people and delivering goods and services. Well-run organizations are integrating both employer- and employee-provided vehicles in fleet programs as part of their vehicle allocation methodology. Operating a cost-effective and efficient fleet often requires relying on the knowledge and expertise of fleet managers, but strategic direction from upper management also acts as a driving factor for such changes. Establishing key performance indicators derived from the fleet organization, vehicle assets, and vendors, permit effective fleet performance. This allows chief decision makers to observe trends as they evolve over time. This article provides 10 specific ways to reduce fleet costs along with ratings on each method’s potential to affect the organization’s overall profitability. Through research, replacements, and preventive maintenance, fleet managers can get the biggest bang out of their fleet dollars. Fuel is one of the largest expenses associated with owning and operating a fleet, typically, second only to asset acquisition and depreciation. In the last decade, the average retail price of a gallon of unleaded gasoline has increased more than 126 percent, with average prices fluctuating as much as 39 percent from one year to the next. During this same period of time, the average retail price of a gallon of diesel fuel increased more than 160 percent, with the average price annually fluctuating as much as 33 percent.